I wet the surface with a wide brush and let my emotions flow with the water. I’m not pushing or trying. 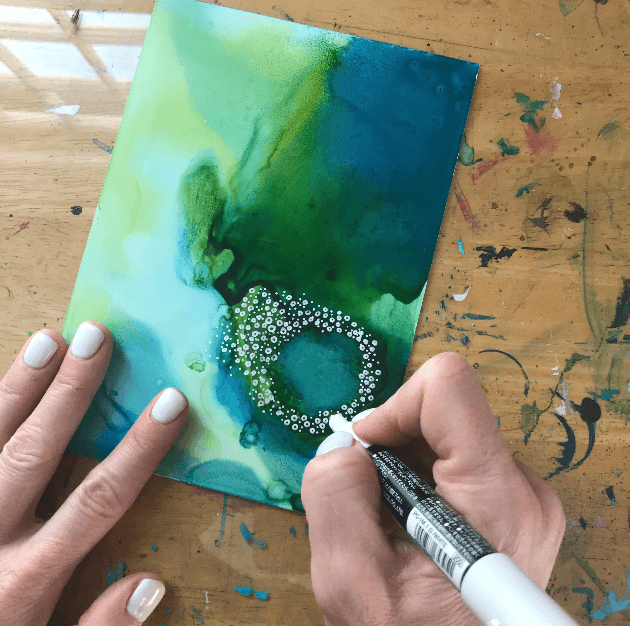 I might be thinking about what’s on my mind, or I might be completely present in the moment, getting absorbed like the water, letting the colors seep into me, and becoming one with my piece. There’s no pushing or pressing, just permission to be in this moment with my paints and myself. I’m open to discover whatever wants to appear on the page before me. 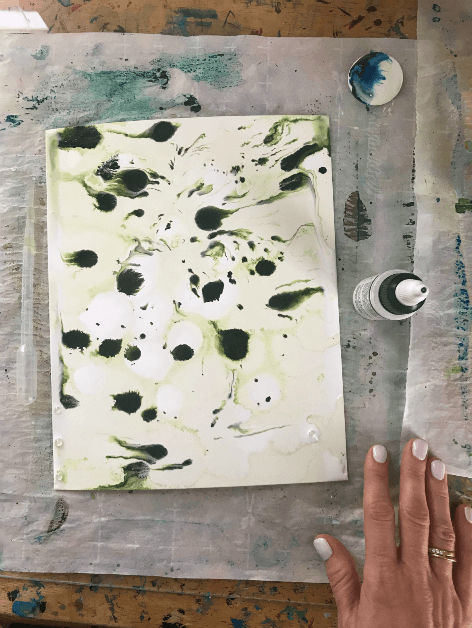 We make a contract, me and the art piece – I can sometimes intervene, nudging the image this direction or that, but I won’t force, or push too hard. I’ll respect the image for what it is, and trust the process will bring me easier breath and a more open heart if I give myself over to it. I could begin critiquing and criticizing my images for perfectionism’s sake, but I’d be disrespecting the tender art pieces who have decided to show up for me. And I know too that I’ll have an opportunity to dress them up, further reveal their secrets and their beauty, when I take my gel and paint pens to the page. That’s why art is a sacred practice for me. I feel as if I’m swallowed up in a different world, a different time – where the mountains are tall, the rivers run deep, and I am engaged in an ancient practice of discovery and renewal. I can feel the Great Mother wrapping her arms around me. Dwelling in my imagination – or the Unknown, is a balm to my soul. I feel a part of something bigger, and therefore, I am more whole. The tightness in my chest eases, my lungs open, and I’m just where I need to be. Within each of us is a wellspring of healing energy, if only we are willing to let it touch us. Stand back. Observe, take in the whole scene. Formulate a plan. Execute the plan, but with flexibility, so I don’t miss good opportunities along the way. When I get stuck, I focus on something small that I know well what to do with. Then return to observing: trying to learn from the water, flowing around the hard objects that stand in the way. 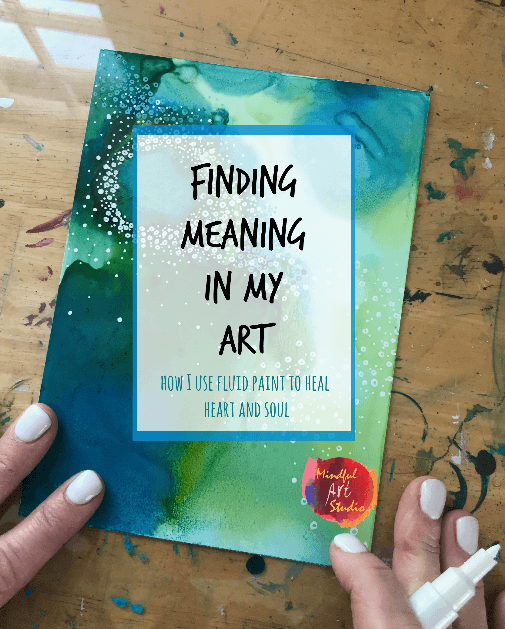 Through Mindful Art Studio, I have the opportunity to share the gifts I’ve been given for finding meaning in my art. Part of what gives me the most joy in this work is seeing you dive deeper into your own practice. 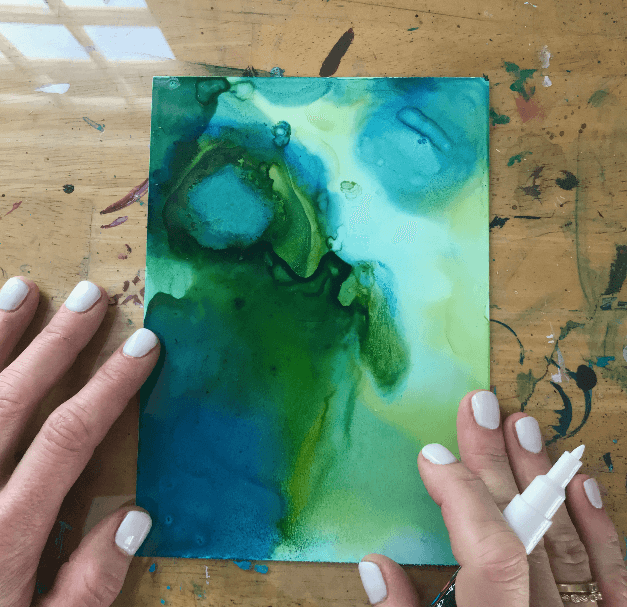 I’ll be doing a free, live workshop this Friday, December 15th at 6pm EST on Mindful Art Studio’s FB page: Fluid Painting – Get in the Flow. You can RSVP here whether you can make it at that time or not, as I’ll have a 48-hour replay available for you. 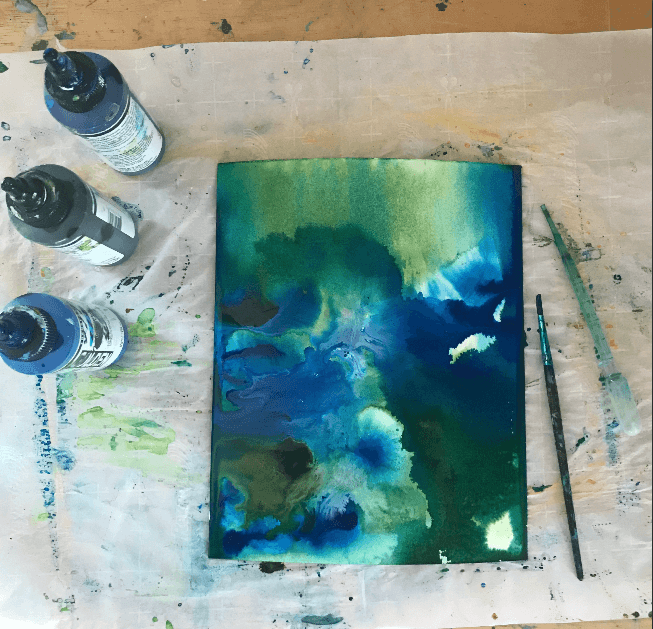 Click here to download my PDF fluid painting tips and supply list. 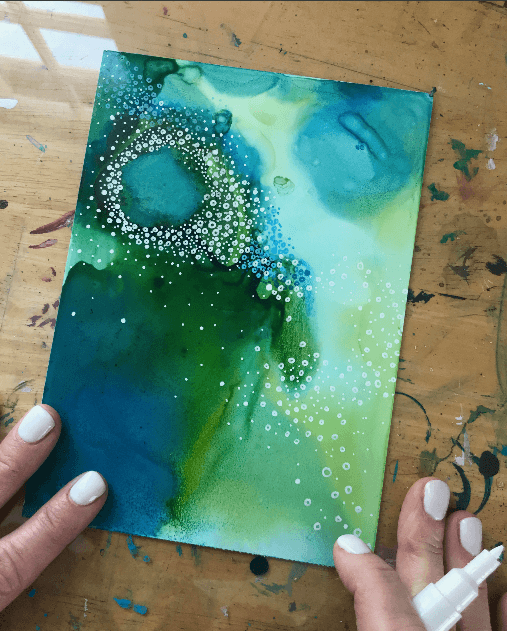 And, if you can’t wait for Friday to let loose with your fluid paints, you can upgrade to The Fluid Painting Workbook with lots of great tips and fun ideas for fluid painting for just $9. I’m looking forward to diving deep with you Friday. I SO know what you mean about life getting in the way. I also know though that we have to sometimes purposefully interrupt that process and I’m so happy that I could help you put your finger on this issue. I can’t wait to see your lovely works. i so enjoyed reading this post from you. 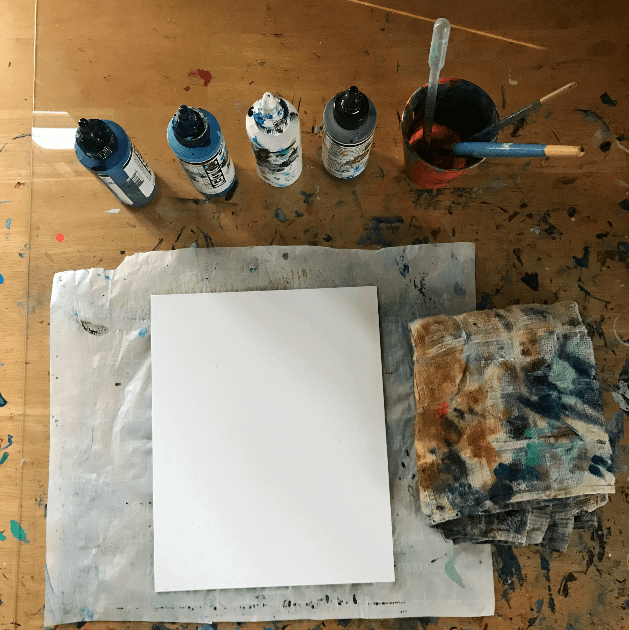 Art as a sacred practice. I love this. It’s one year now that i started my creative self care journey with your support and i just wanted to send a big Thank You :-). All the best for you and your creative enterprises in 2018! I am SO excited to see this comment. Your art is such a beautiful expression of you. It’s so heart warming to know I could help you find this beautiful practice you’ve developed. Beautiful words! I enjoyed reading your post so much as I can relate to every word you wrote. Fluid art is a process which involves every part of the being.. soul, heart and mind. It is a liberating experience that touches the artist in every possible way. Thank you so much for being here and taking the time to read and comment. I loved taking a peek at your beautiful paintings. I can see how much joy goes into them and flows from them.